After having lived in exile for sixty-four years, Pas de Deux is when Eyes meet Soul: A journey of a mother to her homeland, taken along by her daughter. Lake Prespa, Dolno Dupeni, Former Republic of Macedonia, 2012. Dolno Dupeni, Former Republic of Macedonia, 2012. Agios Germanos, or 'German', Greece, 2012. In 2011 and 2012 I was traveling forth and back from South-East Europe, departing from Skopje, Macedonia, following the family’s biographical trail by train, through East-Europe towards Czech-Republic, ending my journey in Berlin, Germany. Subjecting myself physically to the sensation of the journey being a past, ‘contained’ in my body’s memory. It was a personal history that had to be revived, partially re-enacted, to then plunge into the history of this forgotten Greek civil war, researching my family’s biography and that of other women, soldiers, exiles and witnesses, related to Europe’s heritage and the preceding Second World War, listening to personal accounts of loss, trauma, grief, resistance, hope and love. A family portrait of my grandparents with three of their four children; Cena (on the right), Gera (on the left) – the eldest sisters, and Stojan, their son, sometime after 1953 in Czecho-Slovakia. In all these family portraits my mother is the missing person, while residing in Macedonia (Former Republic of Macedonia), she couldn't join the family in Czecho-Slovakia due to political administrative legislation. Which is why it took another five years before reunion with her family, to take place. In what would become a blueprint, as a prelude to a film to be developed ‘Sweet Terror of Memory – ψίθυροι’, my mother and I journeyed by car throughout Macedonia, visiting each city and orphanage (or what was left of it) where she had resided throughout her youth. We interviewed and spoke with a number of women on the road towards Greece. Whence at the Greek border, at Dolno Dupeni, lays Lake Prespa. It is where three borders of nationstates underneath the surface of its cold water meet: Greece, Former Republic of Macedonia and Albania. Dolno Dupeni, where my mother had lived for a year with a familymember, Baba Velika, before she was handed over to the Red Cross to spend her youth in children’s orphanage homes, would be our last stop in Macedonia (Former Republic of Macedonia). Our journey ends at Agios Germanos, her natal village and that of her father, originally bearing the name ‘German’ at the time, as well we visited her mother’s natal village, formerly known as ‘Nivice’. Veselinka standing in the middle, in front of the orphanage in Tito Veles, Macedonia, ex-Yugoslavia. Agios Germanos, or 'German', natal village of my mother. Our first gaze at the family's home, in Greece, 2012. Standing eye to eye with her family home, built by her father and his two brothers, their three initials carved into a stone as proof of existence of their past footsteps and presence, placed just above the entrance of their former farmhouse, today home to a Greek family, left us speechless but for a deeply felt loss and union at the same time. No other impression could have made more clear, what it means to be uprooted and to spend a lifetime in exile. A journey we made together, bringing her back in time, as it were, sixty-four years ago, when she had traveled towards the exact other direction, from Aegean Macedonian territory, her homeland, towards Macedonia at the time part of Tito’s Yugoslavia. Whereas her mother, my grandmother, had to say goodbye to her three daughters, it was then when we both visited ‘German’, that my mother’s journey and story of a lifetime in exile, came to closure as she was brought back to connect with her roots, by her very own daughter. 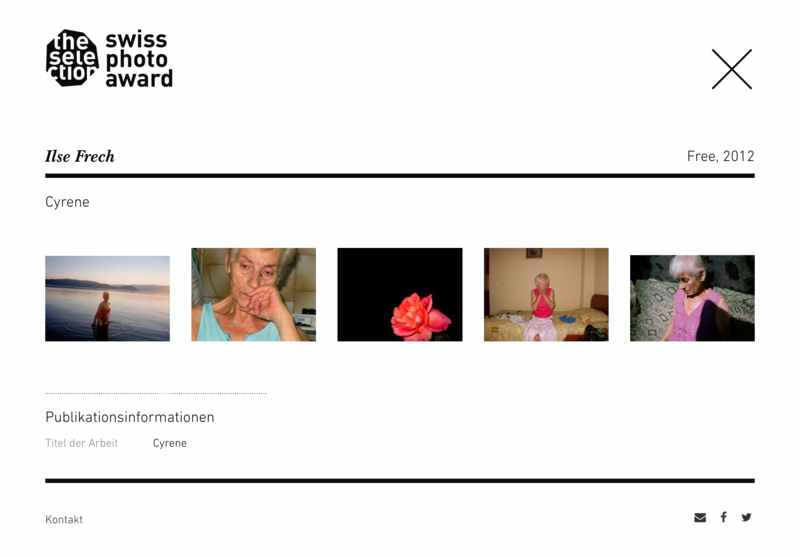 Part of the series, titled Cyrene, can be seen on the website of the Swiss Photo Award selection 2012, ‘Free’ Category ‘. Lake Prespa, Former Republic of Macedonia, 2012. After having lived in exile for sixty-four years, Pas de Deux lets Eye meet Soul: A mother’s journey to her homeland, taken along by her daughter.